I’m not a fan of Andrew Lloyd Webber shows in general. It’s not that I properly dislike them, they just rarely appeal to me. There is one exception though. I adore the score of Jesus Christ Superstar. And if done well I think the show is a truly magnificent piece of musical theatre. 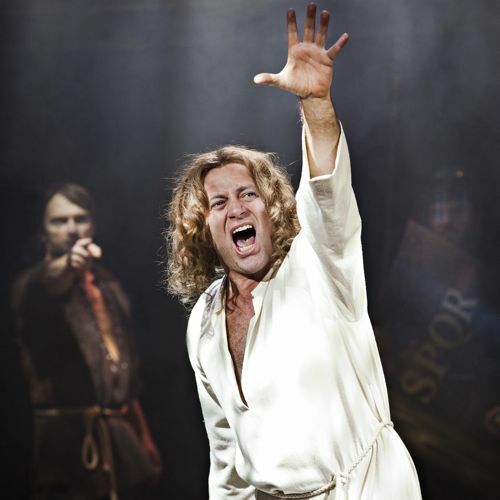 Jesus Christ Superstar is currently on tour in the UK led by Glenn Carter as Jesus. He has portrayed the role in the West End and on Broadway and also features on the Jesus Christ Superstar video (I’m guessing there is a DVD version but I actually do own it in good old VHS format). I can’t fault his singing and acting in this production. He does well with what he’s been given by the director. He is not the best Jesus I have seen but I was pleasantly surprised by his portrayal. There is no denying that he doesn’t fit the role age wise though. Tim Rodgers is a strong Judas and the highlight of this production in my eyes. 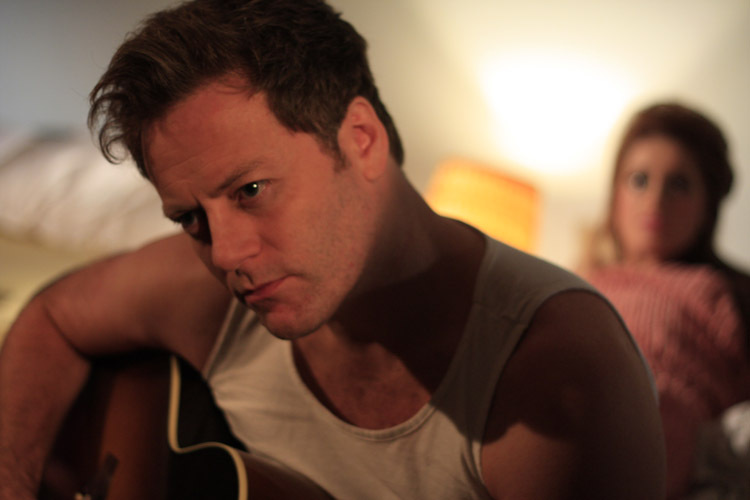 He has a great voice and manages to bring across just the right mix of anger, passion and despair. Rachel Adedeji was off on the night I saw the show and I’m ashamed to admit I can’t remember the name of the understudy – the one time I don’t buy a programme this happens, that will teach me. 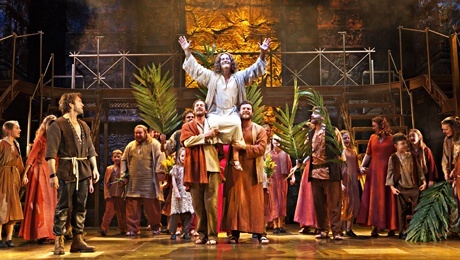 If anyone can help me out I would be grateful because whoever was on for Mary Magdalene was quite simply wonderful: Beautiful clear singing voice and great stage presence, a joy to watch. 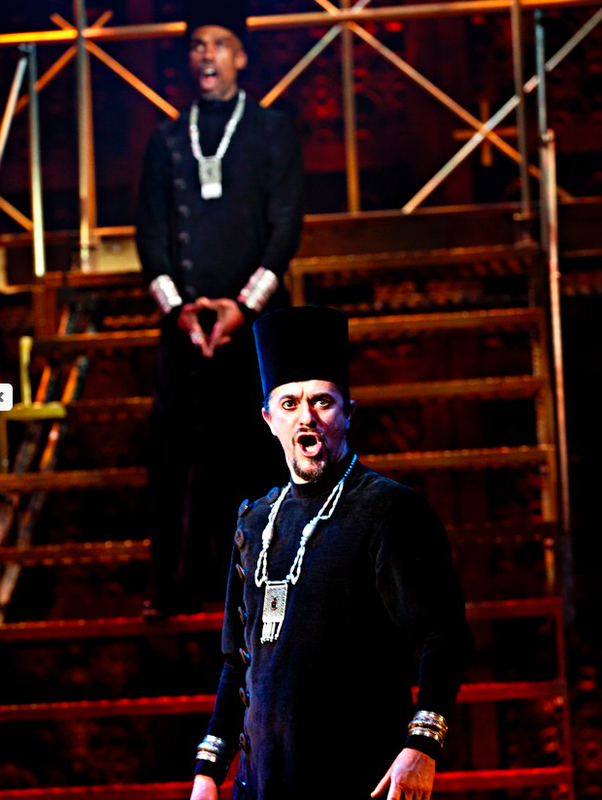 The rest of the cast does a good job – special mention for Cavin Cornwall as Caiaphas and Alistar Lee as Annas whose performances are particularly memorable in this production. When it comes to the score you can’t really go wrong with Jesus Christ Superstar. The staging and direction however is a different matter. My favourite production so far was a modern staging of the show in St. Gallen / Switzerland a good 13 years ago (think Caiaphas in a black suit and Judas dressed all black with a tight shirt and biker boots). This production is a traditional take on the show which is absolutely fine. What – in my opinion – is not fine is the fact that the crucifixion is stretched to unbearable length. You get to witness every nail in the hands and feet in what feels like slow motion all with Jesus screaming and moaning in agony. For me this was painful to watch and completely unnecessary for the narrative. This combined with the fact that the end of the show and the finale have been set up as a kind of resurrection scene are major flaws of this production if you ask me. It’s too much sensationalism followed by too much kitsch. But despite some let downs I enjoyed the show. It’s great to hear the score live and here you get a talented cast who really manages to do the songs justice. I still remember how it all started. 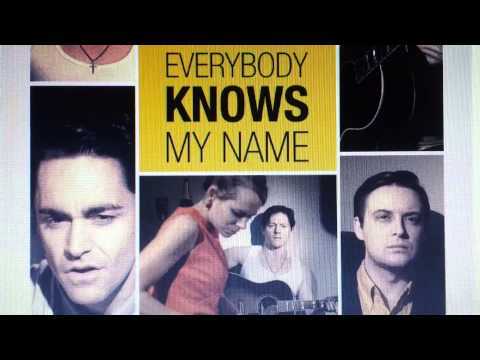 In 2008 I stumbled upon a few clips of this new show which had just opened at the Prince Edward Theatre. This was the first time I heard that voice and I was hooked straight away. This guy named Ryan Molloy hit all those insane notes with such ease – I was amazed and I knew I had to go and see him and the show. It’s actually almost funny that the main reason I booked tickets for Jersey Boys was indeed Ryan and on my first visit to the show the main man was off sick. Was I disappointed? Of course I was. At least until the show started. Because once I got over the fact that Ryan wasn’t on I realised I was watching one of the slickest and most entertaining shows I had seen in my life. The timing in Jersey Boys is incredible and doesn’t fail to amaze me even after almost 6 years of watching the show. That combined with the incredibly talented cast made me fall in love with Jersey Boys straight away. In case you are wondering, my first Frankie Valli was no other than the wonderful Jye Frasca who still has a place in my top 3 favourite Frankies. I started out with the odd visit every 2 months which means I only got to see the original London cast a few times. It wasn’t until after the first cast change that I became a proper regular at the show. But once I started there was no going back for me and up to 4 visits a month became the norm pretty quickly. And here I am, almost 6 years later. I have seen this show develop over the years, I have seen performers come and leave. Every cast has had something special. I’d be lying if I said I didn’t miss the “Original Four” though: Ryan Molloy, Stephen Ashfield, Glenn Carter and Philip Bulcock. Those four guys had a special chemistry that no other Four Seasons combo has been able to match so far (at least in my opinion). So many wonderful people have graced the stage at Jersey Boys since 2008 – it’s impossible to name them all. I feel extremely lucky to have met some of the most talented and nicest performer in the West End through this show, many of whom I have continued to support after they moved on to other shows. This show has been a big part of my theatre life for the past 6 years. And now that its time at the Prince Edward Theatre has come to an end I feel a huge loss. Yes, I realise this is not the end of Jersey Boys. In less than a week a brand new cast (including some familiar faces) will open the show at its new home, the Piccadilly Theatre. However, this is the end of my time as a Jersey Boys regular. Unlike other fans I won’t be moving with the show. For me Jersey Boys at the Prince Edward Theatre was something special and no matter how good the new cast may be, I just feel that it’s time for me to close this chapter. I have loved my 6 years at the Prince Edward Theatre – a place I could probably call my second home by now. I have met some dear friends through this show and I wouldn’t change a thing about my time spent at Jersey Boys. So many people had a part in making those years a wonderful experience, from the cast to everyone working backstage, from the band to the lovely people at the box office and the front of house staff. This is my way of thanking each and every one of you. Without you Jersey Boys would not have been such a great place to spend an evening (exactly 182 of them in my case). I have to take an extra moment to thank one person in particular because without him I might never have booked my first ticket for the show and I might not have stayed with it all those years. Ryan Molloy is not just an amazingly talented performer but also a wonderful person and I’m happy and proud to call myself a supporter of him and his work. I salute his 6 years commitment to Jersey Boys and even though I think leaving the show is the right decision I am terribly sad I will never get to see his Frankie again. All things must come to an end and my Jersey Boys journey ended on 9th March 2014. This doesn’t mean I will never watch the show again. There is no way I am not going to jump at the chance of seeing Ben Wheeler’s Tommy DeVito or Mark Isherwood’s Nick Massi. But my days as a regular visitor are definitely over. It’s time to start a new chapter. Let’s see where it takes me. I first visited the Southwark Playhouse last year to watch their production of Jason Robert Brown’s Parade. One thing I remember from that visit is thinking what an unusual yet interesting performing space this venue is. And I admit I was doubtful there were a lot of shows that would fit into this theatre due to it being a rather dark and gloomy place. However, it is exactly the nature of this unusual theatre that makes Floyd Collins even more gripping and “enjoyable” (that doesn’t seem to be the right word for such a dark piece I admit). Ladders are used to create the tunnels and caves – a simple yet effective way to take the audience along to the world below. The dark and cold vaults of the Southwark Playhouse are the most perfect space for this show and really add to the atmosphere. The show itself is definitely not an easy piece of theatre. It’s the story of caver Floyd Collins who is trapped deep below ground and who’s personal tragedy is turned into a nationwide sensation by the media. I found the score a bit hard to get into yet interesting and beautiful in its own way. Sadly the lyrics were a bit drowned out by the music from time to time. This was the third show I have seen Glenn Carter in (the former being Jersey Boys and The Exonerated) and I really enjoyed his performance. His singing was impressive and I did feel for his Floyd. He gets extra points for having to lay on the cold floor of the vaults for the majority of the show – that must be one of the most uncomfortable parts he’s ever played. 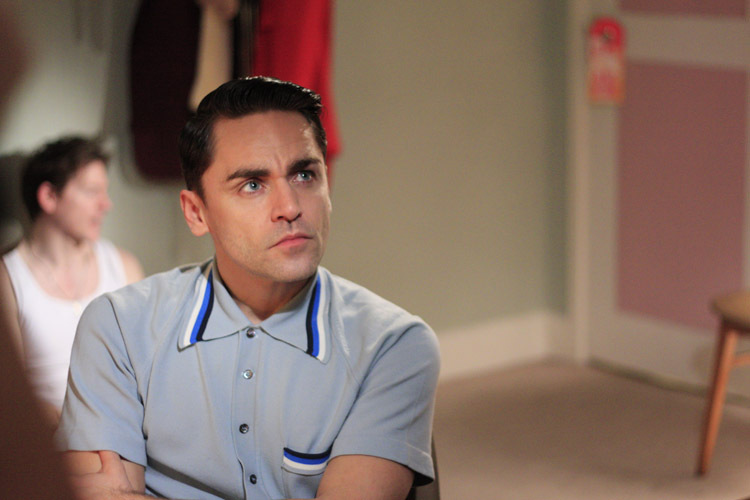 However, the real stand out in this show is without a doubt Ryan Sampson’s Skeets Miller. 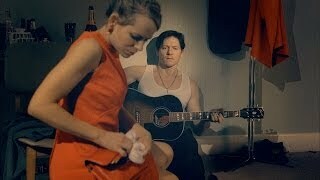 I have rarely seen such an honest and heartfelt performance. Ryan Sampson is definitely someone I will look out for in the future. The rest of the cast all did well but there was no real highlight I have to say (I might just have been too mesmerised by Ryan Sampson’s performance to notice though). I couldn’t really connect to Robyn North’s Nellie and sadly I found Gareth Chart’s Homer a bit bland compared to Glenn Carter’s and especially Ryan Sampson’ performance. So, this show is by no means perfect but (and that’s a big but) it is definitely one not to miss. Why, you ask? Because it’s unusual, it’s something you might not get the chance to see on stage again for a long time and because the cast have obviously working hard to bring this story to life. One very important advice though: Wear layers when you go and see the show. I attended Floyd Collins on a rather nice spring day and I was freezing by the end of the performance – it’s cold in the vaults!